Marley, the new documentary by Kevin MacDonald, has finally been released today. I have been waiting for this day for quite some time, and I know I am not the only one: millions of Bob Marley fans all over the world are hailing the arrival of this film among rave reviews and high expectations for its accuracy and unique perspectives. According to the official website, MacDonald worked closely with Marley's friends and family to ensure that the late superstar's "definitive life story" is told through this work. Of course, the release date is not without appropriate significance. 420 (April 20th) is a number often used by those who use cannabis (in particular, users who self-identity as smokers of the herb for any number of spiritual or political reasons) to signify a sort of... well, nobody knows, exactly. In fact, of the hundreds of habitual pot smokers I have known over the years, from all over the US, nobody seems to know exactly where this number came from. Yet it has taken on a great deal of significance for many cannabis users, for celebration, protest, and fellowship, articulating a perceived satival subculture every April 20th, and even twice a day when the clock says 4:20. Whether or not the number has a known origin, however, it has become a positive symbol for many people, and tonight they most likely will be enjoying the music of Bob Marley while partaking in the Legend's favorite herb. My initial reaction upon reading of Marley's release date was an annoyed, cynical groan: of course these producers (or "reducers," to borrow a term from the Honorable Priest Kassa) would capitalize on juvenile trivializations of Bob, his Rastafari faith, and their sacramental herb. Marley was certainly known for smoking massive amounts of cannabis, but his was not an escapist use of the mind-altering plant: like many Rastafari, he believed that ganja is an aid for meditation. I have seen many herb-loving Marley fans posting excerpts of an interview in which the singer states, "The more you accept herb is the more you accept Rastafari." He goes on to condone smoking herb as an inspiration for rebellion against authority. In many other public statements and song lyrics, Marley praises ganja in no uncertain terms. In the interview clip below, however, he qualifies his endorsement of cannabis with some words of wisdom: "Too much of anything good for nothing, ya know? ... So, you have too much herb, it might hurt ya." I can't help but wonder what Bob would think of millions of his fans setting a day aside to smoke a lot of herb and stare at black-light posters while listening to Rebelution, or to celebrate rebellion for rebellion's sake. Even more so, I wonder what he would think about a documentary on his life being released on this day in which "too much of one thing" is rationalized. Granted, the spirit of Rastafari is one of rebellion - in particular, a struggle against evil and oppressive institutions. But Marley's life was so much more than a promotion of an illegal substance, and I hope that this new film shows many of his admirers that Bob's struggle was about much more than getting stoned. If you've seen the same internet I've seen today, the Marley quote you've seen the most is this one: "Herb is the healing of a nation; alcohol is the destruction." I'd like to close with a few of my personal-favorite Marley quotes, lyrics and statements that say more about his spiritual worldview. Some of these are, in fact, paraphrases of Bible verses; however, I have included them because, in my opinion, Bob had a special way with words, and he gave these proverbs new life for a new context. 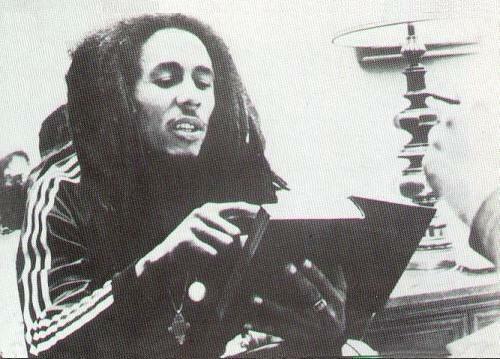 Please share your favorite Bob Marley quotes, lyrics, facts, or opinions! I realize that we all appreciate Bob's life and music for different reasons, and your ganja-centric version of the man may be just as valid as my perception of him as a more spiritually disciplined visionary. No disrespect to any of you 420 observers was intended in my comments above - this has been all in good fun! And let me know your thoughts on the movie. I hope to watch it tonight!